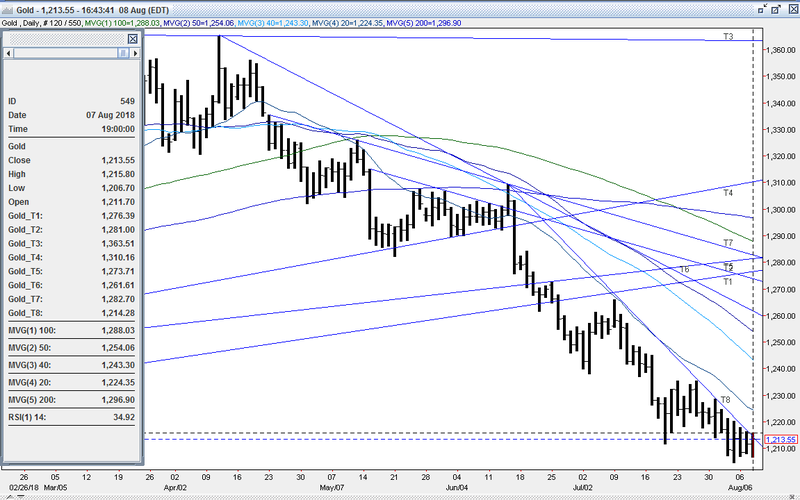 Gold traded in a range of $1209.40 - $1215.80 overnight, largely fading movements in the US dollar. The yellow metal rose to its $1215.80 high during Asian time, briefly breaching $1214 (down trendline from the 6/14 $1309 high), but a lack of follow through buying led to a quick move back to $1213. 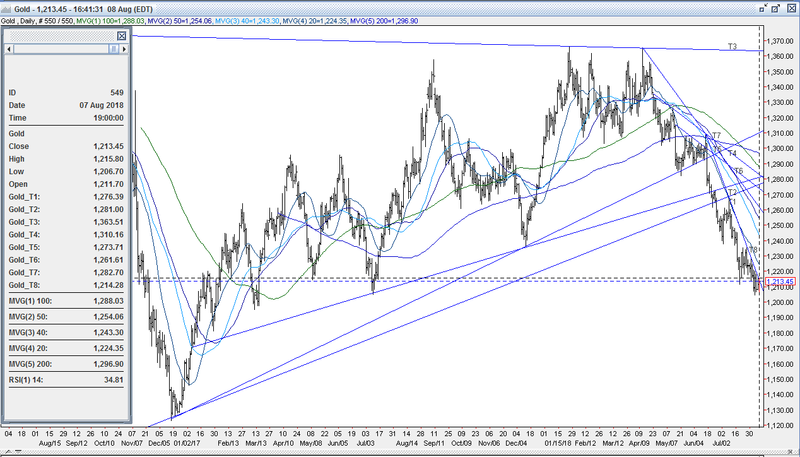 Gold was buoyed by a decline in the dollar, as the DX fell to yesterday’s low of 94.99. The dollar was pressured by strength in the yen (111.44 – 110.82, 2-week high), which despite some softer Japanese economic data, strengthened from the a slightly hawkish view of the BOJ’s Summary of Opinions and attracted some save haven bids. This was amid news that the US was proceeding with a 25% tariff on Chinese imports to begin on 8/23 and China’s response with its own retaliatory $16B of tariffs on US goods. However, gold fell during European hours to its low of $1209.40 as the DX rebounded to 95.36. The greenback was boosted by weakness in the pound ($1.2960 - $1.2855, 1-year low) after the UK government was said to be planning a no-deal Brexit meeting in September. Global equities were mixed with the NIKKEI off 0.1%, the SCI down 1.3% (Chinese trade surplus with US slips), European markets were up from 0.1% to 0.9%, and S&P futures were flat. A dip in oil prices ($69.30 -$68.50) from weaker Chinese import data, and comments from Iran saying the US won’t stop its oil exports weighed on equities. Some hawkish commentary from the Fed’s Barkin (“U.S. economy is strong enough to warrant further interest rate increases”, “Difficult to argue that lower than normal rates are appropriate when unemployment is low and inflation is effectively at the Fed’s target”) just after the NY open lifted the US 10-year bond yield (2.966% to 2.986%), and drove the DX to 95.42. Gold fell further, igniting some sell stops under yesterday afternoon’s $1209 low to reach $1206.70 where support at the 7-bottom low between $1205-08 held yet again. Gold quickly rebounded, however, as dip buying emerged (as we’ve repeatedly seen for weeks), and took the metal to $1213, before some residual selling interest knocked it back down to $1208.50. US stocks opened weaker (S&P -5 to 2853), weighed by the US-China tariff news, weakness in Disney shares (worse than expected quarterly report last night), and a further decline in oil (WTI to $66.32, EIA reports lower than expected draw in crude, surprise build in gasoline). The US 10-year yield dipped to 2.964%, and the DX traded down to 95.13. Gold rebounded in response, and clawed back to $1210.75. Into the afternoon, US stocks turned modestly positive (S&P +3 to 2862), with financials and tech leading gainers. The US 10-year yield worked lower though, with some safe-haven bids taking it down to 2.958%. 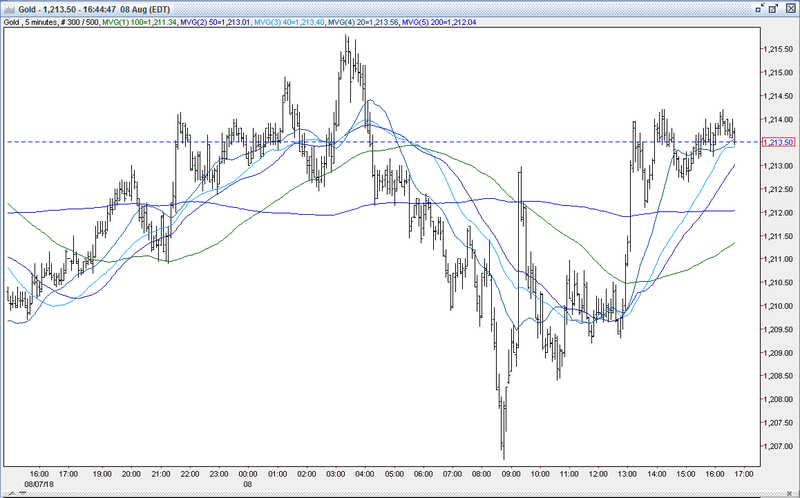 The DX slid to 95.05, and gold bounced back to $1214. Later in the afternoon, stocks slipped on news that the US is to impose new sanctions on Russia for the nerve agent poisoning of a former Russian agent, and that the SEC was investigating Elon Musk’s tweets yesterday about taking Tesla private (S&P finished -1 to 2857). The 10-year yield hovered around 2.96%. The DX ticked up to 95.10, helped a bit by the Russian rouble getting clobbered (from 63.40 – 65.65). Gold was steady between $1212.50 - $1214, and was $1213 bid at 4PM with a gain of $2 – again unable to breach and hold above the key down trendline at $1214. Open interest was up just 81 contracts, showing a near balance of some early short covering and new longs up to yesterday’s $1216 high followed by some long liquidation and some dip buying new longs later in the session. Volume was a little higher with 214k contracts trading. Bulls were again disappointed that gold failed yet again to take out its down trendline from the 6/14 $1309 high at $1214 - despite the DX slipping again below 95 last night. However, they remain steadfast that gold has or is very close to putting in a major bottom. They maintain the market has been extremely oversold - having dropped $160 (11.7%) since 4/11, and $104 (7.94%) since 6/14. Also, its 14-day RSI has spent only 6 sessions north of 35 since 6/14. Bulls strongly believe that the dollar’s rally is overextended, and expect a meaningful correction in the greenback from its recent 95.66 1-year high (up 8.40% since its 88.25 low on 2/14) to help trigger a significant short covering rally in gold. Bulls are looking for a breach of $1214 (down trendline from its 6/14 $1309 high, options) to trip some buy stops to test next resistance levels at the double top at $1220-21, the $1225 options strike, the double top at $1228-29, and then $1235-38 (old support level, and triple top) – and some believe that this can be done in a cascading fashion. They expect a significant correction to at least $1257 – the 50% retracement its move down from $1309 (4/11 high) to last week’s $1205 low. In addition, bulls maintain that Friday’s Commitment of Traders Report with a historically and relatively very low Net Fund Long Position (35k contracts, low since Dec ‘15) and a massive and growing gross short position (+2k to 172k contracts –short side of gold becoming a very crowded trade) leaves this market set up in a highly favorable position to move higher from potential heavy short covering and sidelined longs returning to the market. Some bears remain comfortable trading range, and are awaiting some modest strength to re-establish short positions. However, other bears are still looking for gold to decline significantly more, as witnessed by Friday’s COT Report showing another build in fund gross shorts (+2k contracts to 174k contracts). They feel fuel from a firmer dollar (DX touched 95.66 on 7/19, fresh 1 year high) will continue to provide downside pressure on gold, and that the dollar’s ability to strengthen against other currency majors still has legs. In addition, they feel that continued strength in US equities (S&P within 0.5% of all-time highs) will put additional pressure on gold. They will be gunning for stops below $1205-08 (6 bottoms) to lead to a test of $1200 followed by $1195-98. All markets will continue to focus on geopolitical events, developments with the Trump Administration (especially on US-China trade), Q2 corporate earnings, oil prices, and will turn to reports tomorrow on Japan’s Machine Orders, China’s PPI and CPI, the ECB’s Economic Bulletin, US Jobless Claims, PPI, Wholesale Inventories and Wholesales Sales for near term direction. Gold – How bad can it get?